Measure goal conversion rates by company size, industry, etc. Create audiences for remarketing based on company name, size, industry, etc. You can use the Reveal API to perform lookups and integrate the results into your apps or whatever, but the most straightforward use case is to use Clearbit Reveal Google Analytics to enrich your web traffic data. If you use Segment to deploy your Google Analytics tracking code, Clearbit has a setup guide here. That guide gave me a few issues, so I wrote this short-ish addendum to help you overcome any hurdles. Head over to clearbit.com and create an account. Once you’re logged in, on the left sidebar, click “Get Started.” Scroll to the bottom and click “Reveal” (or just follow this link). Now here’s where things can be a bit confusing. You’ll see an integration for Segment. That’s not what you want. The Segment integration is for enriching events that flow through Segment on their way to the destinations (or warehouses) you have set up there. You want to pick Google Analytics (or follow this link to their setup tool). All of my Custom Dimensions were previously used, so the tool blew up for me with the message badRequest: Error creating this entity. You have reached the maximum allowed entities of this type. I figured the tool would ask me if I want to rename/overwrite my dimensions, but it didn’t (maybe GA’s API doesn’t allow PUT/PATCH?). Take note of the analytics.ready line — that’s needed to ensure that Clearbit waits until Segment has actually loaded GA onto the page before interacting with it. If you’re getting a ga is not defined error in your Chrome console, you’re likely missing the analytics.ready call. Here’s the problem: the default snippet doesn’t contain all of the dimensions I want. Where’s Global Alexa Rank? What about Country? I added these dimensions to Google Analytics, but they need to be in my snippet. I know which dimension numbers to map them to (I just need to look in GA), but what about Clearbit’s mapping names? 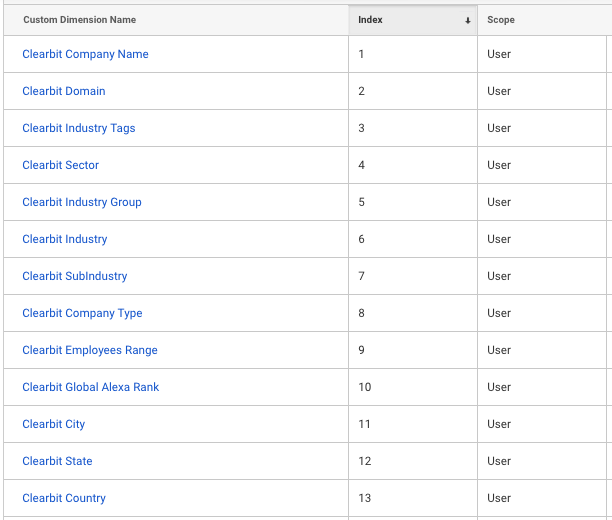 Is Clearbit Global Alexa Rank supposed to be “companyGlobaAlexaRank”? Or maybe it has to be “companyAlexaRank”? If you guess wrong, it won’t work. The above function shows me what Clearbit expects each mapping name to be. Clearbit should consider adding them all to the default snippet and let people remove the ones they don’t want. Installing with Segment? Next to Segment? Well, turns out you DO have to integrate the Cleabit Reveal Google Analytics snippet manually outside of Segment. You will find a Clearbit destination in Segment, which might be tempting to activate, but it’s not for this. Again, that’s for enrichment. Hope this helps clear things up (ha ha! ).